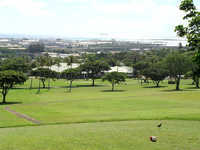 The 9-hole Walter Nagorski Golf Course in Fort Shafter, HI is a military golf course that opened in 1919. Designed by Army Corp of Engineers, Walter Nagorski Golf Course measures 2837 yards from the longest tees and has a slope rating of 120 and a 33.7 USGA rating. Overall, the course is just ok. Greens are pretty nice, but the fairways are littered with embedded large rocks that could pose an impact risk, should the grass grow over them. Test the ground around your ball before you take a divot.